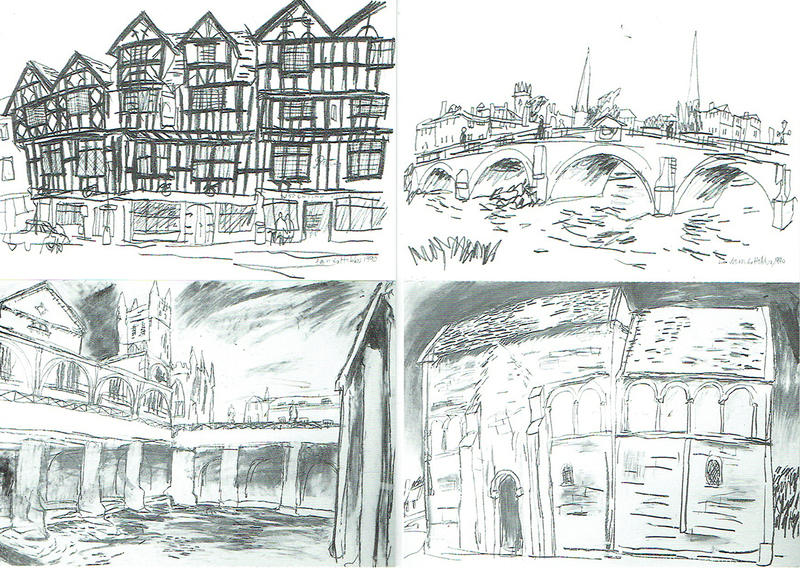 As part of my postgraduate study at City, University of London, I created a drawing resources guide. It seems a good idea to share it here too - it's pretty much copied and pasted as it was for that assignment. It doesn't claim to be fully inclusive, and it is UK-centric, but I came across useful and to-me unexpected things as I researched it. I've spread it across four posts. Links to subsequent parts can be found at the end of this post. This resources guide is aimed primarily at artists who have some experience of drawing, perhaps through an art or design school education at foundation or undergraduate level. There is a big industry aimed at those taking up drawing for the first time, which this guide does not generally include, although less-seasoned artists should still find useful points of contact here. Drawing has been having something of a renaissance in recent years, and many of the resources referred to here are relatively new and rising to prominence. They range across books, publications, libraries, museums, television and art materials stores. Two-dimensional graphic work, especially when small and highly portable, is easily scanned and shared online, and the internet has led to a variety of online communities: website addresses are included where appropriate, and street addresses for those in a specific location that can be visited. They are almost entirely UK-based, although references to a few international organisations are also included. Many of the resources listed below make the most of the variety of social media on offer – which at this time means Twitter, Facebook, Instagram, Vimeo or YouTube. These give the opportunity to make contact with artists with a similar interest in drawing, with all the benefits that can bring. But there are a growing number of centres dedicated to drawing that run events, workshops, lectures, competitions or exhibitions where it is possible to see works as they are best viewed: in the flesh. Formerly a monthly print magazine (Artists Newsletter), but now entirely online with a membership of more than 20,000 artists, a-n includes news, exhibition reviews, blogs, campaigns, business advice, job opportunities and networks to enable contact with other artists and curators. Although a-n is aimed at practitioners across the whole range of contemporary practice, it is an important hub for those who draw. Axisweb was set up in the 1990s by the then Arts Council of Great Britain as a slide index located in Leeds as a means by which commissioners could search for artists. It now presents the work of more than 3,000 selected artists through its online Axis Directory, and acts as a focus for curators, commissioners and the public. The website includes video playlists, an Artist of the Month, a series of guides to help artists on such subjects as writing a CV and building an online presence, and curated and editorial sections for user-generated content. DRAW International describes its role as "fostering artistic research to promote and reveal ideas within a contemporary context". This centre of research for postgraduate art and design education is based in France, and organises residency programmes in its studio spaces, along with lectures, conferences, tuition and exhibition space. This growing archive includes architectural material that focuses on drawing as the "exploration and discovery of ideas and means of suggesting them". The website, along with events and other activities, encourages a widening discourse on the ways innovation and creativity are advanced through the sketch, the sketchbook, the study drawing and rendering. The website provides factual information and short texts that relate to drawings it presents from the archive, organised under themes such as Drawing of the Week, By Invitation, and Topics. An international network of institutions and researchers, artists, designers and educators who are involved with the promotion of drawing as a practice, either professionally, academically or through everyday activity. A website dedicated to graphic imagery making a social comment dating from the beginning of the 20th century to the present. Subjects include the terrorist attacks on the USA in September 2001, the Mexican revolution, and Soviet poster art. Hatch describes itself as providing a community and platform for drawing and related areas of research, practice and exploration. Its AIR (artists in residence) programme features collaborations with artists who propose and undertake specific drawing-based projects. Hatch was founded in 2012 as a research project under the PLaCE Research Centre at the University of the West of England, Bristol (see below). LAND2 ("land squared") is a national network of artist/lecturers and research students with an interest in landscape/place oriented art practice founded in 2002, and hosted by Leeds University. It meets for symposia and conferences and for presentations of members' work, and has links with PLaCE International (see below), with which it has similar aims and interests. PLaCE International (Place, Location, Context and Environment) is a consortium of academic research centres and individuals who address issues of place, location, context and environment (the initials of which contribute to the group's name) across various disciplines, through research projects, creative programmes, educational activities and international partnerships. Founded at the University of the West of England, Bristol, it is now located at Duncan of Jordanstone College of Art and Design, Dundee, with links to the University of Minnesota, USA, University of Melbourne, Australia, and Université de Nantes, France. Reportage artists such as George Butler and Olivier Kugler are still in demand for the unique insight that their work can bring to events that are newsworthy, such as the war in Syria or homelessness. Reportager focuses on drawing as reportage, visual journalism, documentary drawing and illustration as a visual essay, with its website acting as an editorial space for the dissemination of good practice. It includes news, opportunities, links to reportage projects, films, and information about leading reportage artists. An independent education and research network that hosts symposia, fosters collaboration, and runs occasional educational courses and workshops. These online resources are invaluable for research into recent graphic art, with access to full text, indexing and abstracts. Subscription based databases may be accessed through institutional log-ins, and through libraries, such as the National Art Library. This includes full text articles, indexing and abstracts from more than 300 publications, and indexing and abstracts for peer-reviewed journals and dissertations with an art theme, including the graphic arts. Abstracts of journal articles, books, essays, exhibition catalogues, and reviews of modern and contemporary art dating back to the late 1960s. This is an online biographic dictionary of British and Irish artists and designers, which includes movements, schools, organisations and galleries, with a focus on the 20th century. Artstor is an online resource with a mission to enhance scholarship and teaching through digital images and media. The not-for-profit digital library includes more than 2 million high-resolution images from 280 collections. They are searchable through keywords, dates, geography, classification and collection from institutions including the Museum of Modern Art, New York, and Berlin State Museums. Oxford Art Online is the access point to a range of authoritative art reference resources, including Grove Art Online, which includes biographies, articles and images, the Benezit Dictionary of Artists, with 170,000 artist entries, and The Oxford Companion to Western Art, among others. Part 4: drawing schools, prizes and awards, and suppliers.